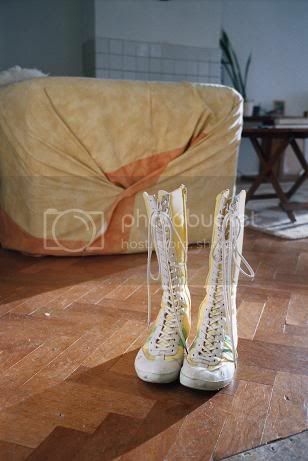 I'd been eyeing these bright yellow, green and cream Quick lace-up boots for a week or two...Yesterday, they finally came home with me. My Dad nearly choked on his ice tea when I showed them to him, they're that bright; and this morning, some of my co-workers shaded their eyes before commenting on my latest acquisition. In other words: they're a huge success. I think I might take them with me to Moonlight Rising, see what JM thinks! Maybe they'll inspire him to finally ditch those awful white trainers he seems so fond of wearing all the time. Suzanna came in with a new do this morning, which has inspired me to scrape together all my courage and put myself back in the hands of my hairdresser again, because at the moment it just looks horrible. And if I can make an appointment with Juan, I'm sure he can salvage some of what his assistant ruined last time I went in. I know that sleek is all the rage these days, but my hair never wants to stay that way, and I'm too effin' lazy to bother with styling...plus I hate all those sticky gels and stuff. As usual, my weekend was far too short to fit in all the things I'd like to do, but at least I managed to watch and discuss Winding Roads with db2305 on Saturday. We got so caught up in the discussion, of WR, of JM, of AtS's recent cancellation, and of fanfic, that I never got around to inspecting her fashion purchases. Luckily, she remembered at the very last minute, and doubled back to show me her new pinkish/tan flat-soled sandals, which I'm sure will look marvelous on her this summer. Kraftwerk are playing Amsterdam tonight. Unfortunately, I found out about it too late to get a ticket...and besides, I've got an elsewhere to be. Pity; I'll just have to make do with my CD-Rom drive today. Do you think JM would like ladies boots? They'd delightful with the kilt. Do you think JM would like ladies' boots? Why ever not, what's not to like about ladies' boots? His whole wardrobe (pile of clothes?) is bleuuggghhhh, why should his feet be any different. Men don't have a lot of choice though, but I like the black boots on them best. I beg to differ: granted, they don't have as broad a range to choose from as we do, but if they're willing to look and windowshop, they should be able to find something a little more shall we say, distinctive? And trainers come in all shapes and colours. Going for white running shoes just says 'I've got no imagination whatsoever, and I hate shopping for shoes anyways'. I think that hits the nail on the head. Yeah. Mine refused to be made over, although I did get him in some better T-Shirts. I was just trying to make him a little more punk. He has so far refused to put on my old, long black coat. Git. He has so far refused to put on my old, long black coat. Well, that's just stupid. I'm sure he'd look fantastic in an old, long black coat (is it leather?). Yes. It's very 70's with big lapels. I got it for 2 pounds fifty when I worked for Oxfam. Doesn't fit me anymore, alas. Just noticed the 'pocket calculator'. Bob is always going on about that song. It's funny I've got 'Cracked LCD' by Ladytron stuck in my head right now and it's like a modern version of that Kraftwerk idea. You should hear Ladytron. There's no question they were influenced by Kraftwerk and Depeche Mode, just with a girl singer and the occasionally more modern beat. Their album could fool you in places that it was recorded in the early eighties. I think I will, now. It sounds like just the sort of thing I might enjoy! Are they on Internet, I wonder? I'll just go look! Tell you what, I'll burn you a copy. Ooooooh, lovely! You are so good to me! Maybe they'll inspire him to finally ditch those awful white trainers he seems so fond of wearing all the time. They are horrible. But as a friend of mine pointed out, they are proof of his heterosexuality, which was important if said female wanted to date him. Are they? Hmmm...must be an American distinction. I know enough gay men that go for white, too! Lol. All the gay men I know stay away from the bright white trainers. Good luck with the hairdresser - although if it's sleek you want, get yourself some ceramic straightening irons. I love mine with a passion. In minutes they transform my frizzy mass into something resembling sleek without the need for anything sticky. So clever. I thought you were going to get those shoes you'd lusted over at L K Bennet's? They sounded like they might ust be the thing. But if white trainers are what you have and you feel comfortable in, bring them! Who cares what I think? You'll need a pair of trainers to go traipsing round New York with, anyway. Which reminds me, must talk to Fran about us staying at her place. You'll like the Upper Eastside. And if she can't have us, I've already been informed we can stay at the House of Redemption (a church property, used to belong to the Vanderbilts but is primarily used as a retreat for overworked vicars these days). In truth, I only wear the white trainers at the gym. And they aren't so much white as silver-ish and turquoise... Can't bring myself to part with £135 for a pair of shoes, sweet as the little shoes are, but I did buy myself a pair of Roberto Vianni ankle boots in the sale last week. But they are a very staid and very dull chocolate brown. I was just thinking we should start to sort out some accommodation in NYC. I was thinking along the lines of a run-of-the-mill hotel but, blimey! You know the most interesting people! A retreat for shagged out vicars - coo! You know the most interesting people!